Why can't Tiger Woods pull it together to win? 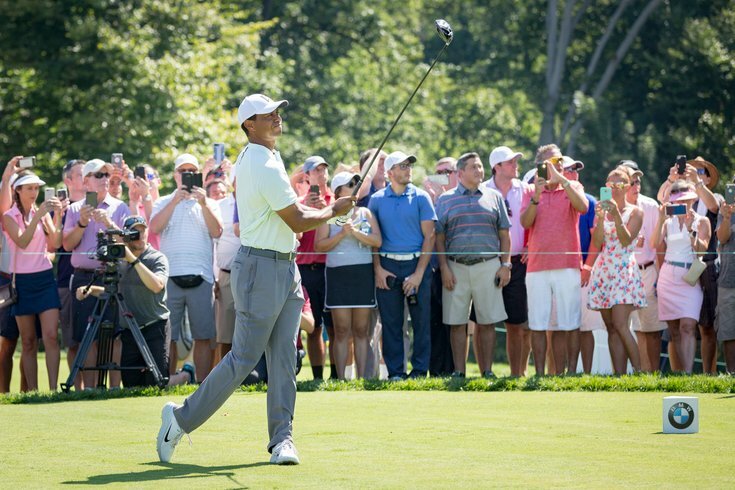 Tiger Woods watches his tee shot at the 10th hole Thursday in the first round of the BMW Championship at Aronimink Golf Club in Newtown Square, PA. He's back in the national conversation as a golfer and not as a controversial figure. He's back as a competitive force on the PGA Tour nearly every week. And he's back in midst of the race for the FedEx Cup. But the last time he won a pro tournament, the current leader of the BMW Championship was a sophomore in college. The last time he won a major, Xander Schauffele was only 14. There's a reason for that. Woods not only had to deal with a very public and embarrassing divorce and personal crisis that was on Page 6 nearly ever day, he's had several surgeries, including back fusion. And on Thursday in Newtown Square, Delaware County, Woods tied the course record at Aronimink with a 62. "Not a lot of people thought that was possible," the 42-year-old said of his return to competitive golf. He followed his 62 with an even-par 70 in Friday's second round, as players left and right dipped into the mid-60s on a soft and wet day that saw a lot of low scores. He is not all the way back yet. "I didn't make any putts," Woods said after bogeying his last two holes Friday to fall behind Schauffele by five shots. "I hit a lot of beautiful putts that were on top of the edge and then obviously hit a couple bad ones on the last hole but looked like all the putts were going to go in but they didn't go in today." Everything seemed to find the jar Thursday while nothing did on Friday. It's a bit of a trend. Woods has five top 10 finishes this season and two seconds. He's been right there on the first page of many leaderboards but he can't seem to put four rounds together to seize a victory. One or two missteps late in tournaments has been enough to undo Woods down the stretch this season. There are two reasons for his failures of consistency. When he's making putts, he isn't driving the ball very well, and vice versa. The stats back it up. What do these numbers mean? Well when he puts it in the fairway, he puts it on the green and when he puts it on the green he usually putts pretty well. Woods changed putters and drivers recently and in his Thursday 62 it showed. If he wants to find a way to fight his way back within striking distance in the BMW, he'll need to put it all together for 36 more holes. "I got to make birdies," he said. "I have to make birdies and try and keep pace and this golf course will be playing soft and getable and tomorrow will be the same tings. "My ball striking has been very good, been consistent and my switching to this driver has made a bigger difference, especially in my body. I don't have to swing it has hard to clear." Woods is stuck at 14 major titles and 79 total wins. He's playing well enough to add to it — but just like a baseball team needing to piece together timely hitting, he has to put it all together at the right time. And at 42, his time is running out.